Birds are any of the species of vertebrates that belong to the taxonomic class Aves. Birds make up the largest group of vertebrates with the exception of fish. They are also the most spoken of animal in the Bible with over 35 individuals mentioned. (Porch, p551) Birds are found on every continent, in almost every environment, and in a dazzling array of sizes, shapes and colors. They truly illustrate the marvelous ingenuity of the creator God. The IOC World Bird List at present (Ver. 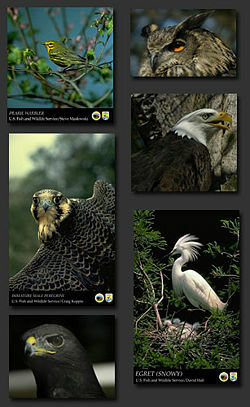 3.2) shows 10,466 species of birds in 40 Orders. The 2256 Genera are found in the 231 Families (plus 6 Incertae sedis). A bird's skull and neck vertebrae. For birds the process of reproducing and raising young is very complicated, it may involve nest making, courtship, signing or all three just to attract a mate. Courtship is basically the male’s attempt to attract a mate. Most will try to attract the female’s eye with bright colors or, most commonly used, by singing. Birds are oviparous (they produce eggs outside of the body) producing amniotic eggs. (Porch, p553) The male’s reproductive organs consists of a pair of testes that produce sperm. The female reproductive organs is an ovary which produces an ova that is then transported to the cloaca. Fertilization occurs inside the oviduct where the egg is formed. Birds live on every continent and in almost every environment, from the freezing South Pole to the extremely hot equator. Within their environment birds deal with three main factors; competitors, vegetation structure and trophic levels. Vegetation structure best determines avian diversity. Competitors can be either other birds of that same species or a different species competing for food or a place to live. Since no two species can occupy the same niche the competition can be fierce at times. There tends to be more species in the tropics because of the fact that there are more and larger arthropods in the tropical forests than in temperate zones providing a better food source. Territorial behavior is typically found among song birds, but can also be found in a few other orders. A territory is an area that a bird or group of birds defends against others of a different or their own species for a period of time. Territories serve six main purposes: to provide nest sites, pair formation facilitation, reduce disease, as well as predation, reduce aggression, stability of resources, and population control. It provides a place to nest and rear young. The male can attract a mate based on the quality of its territory or pair formation facilitation. The reduction in disease and predation is more of an effect. Once the territories are established there is a reduction in aggression due to the fact that there is less competition. There is also a stability of resources because they are in the territory and are more predictable. Population control is also more of an effect; the resources are not depleted by everyone. Birds have also been affected by, and have affected humans since the beginning. Birds have been a source of food for humans as well as pets for humans since creation. Birds have also been the carriers for diseases, a particularly lethal form of influenza was spread by birds in 1997. 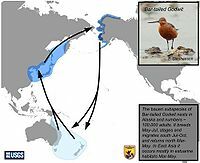 The Bar-tailed Godwit Migration Route. A flightless bird: the ostrich. 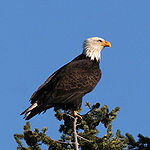 A bird of prey: the bald eagle. A game bird: the chicken. According to the Genesis account of creation, birds were created on the 5th day of creation along with sea creatures. Evolutionists generally believe that birds evolved from dinosaurs, but there is still much debate about how they evolved. Jonathan Sarfati comments below. Recent discoveries are now dispelling this belief that birds evolved from dinosaurs. Both animals have been found to have lived as contemporaries, and in fact, birds have been found in the fossil record earler than the theropods that evolutionists claimed they evolved from. ↑ Dyke, Gareth. Winged Victory: Modern Birds Now Found to Have Been Contemporaries of Dinosaurs ' 'Scientific American, Published July 2010. ↑ Science 2.0 (2009, June 9). "Theropod Dinosaurs Evolved Into Birds? Not Likely, Says Study." Avian Reproduction: Anatomy & the Bird Egg Gary Ritchison. People.Eku.Edu. Eggshell Wikimedia Foundation, Inc. Wikipedia. COMMUNITIES AND ECOLOGY ©Ornithology.com. Ornithology. Birds and Humans Answers Corporation. Answers.com. This page was last modified on 17 May 2016, at 16:37.